We love our dogs for so many reasons. We learn from an early age that it is safe to confide in a canine bestie. We share everything, from naps to snacks to heartaches and triumphs. And sometimes we also share dry skin struggles with our dogs. Dogs get so many conditions that people also get, and dry skin is one of the most common ones! So now here you are searching for the best dog shampoo for dry skin to help your furry sidekick find relief! Does your dog suffer from dry skin? Are you frantically searching for the best shampoo for dogs dry itchy skin? Read on to learn about the best dog shampoo for dry itchy flaky skin, dandruff and other conditions! Does your dog have dry skin? Just like your skin, your dog’s skin is made up of three layers: the outermost epidermis (with a bottom connective membrane), the dermis and the subcutis. Your dog’s hair follicles, oil glands, claws and sweat glands all rely on the skin to stay healthy and functional. They also rely on the deepest skin layer for electrolytes, fluids, nutrition in the form of energy and insulation from temperature extremes. So the skin is vitally important to your dog’s overall health and comfort! If any area of the skin becomes compromised, whether by exposure to environmental toxins, allergens, personal care products, injury, microorganisms, or other causes, your dog may start showing signs of discomfort and distress. Experienced dog owners often know the warning signs of dry skin in their pups. But if you are learning the ropes of dog ownership for the first time, you may wonder how you will know if dry skin is causing your dog discomfort! Your dog persistently scratches, licks or bites at a certain area of skin. You notice your dog has developed skin flakes (dandruff) or scabs. You see areas of skin that look red, raw, scaly, oily, bumpy or inflamed. Your dog’s skin gives off a strange new odor. Your dog seems to have developed acne, a rash or lesions. You notice your dog’s fur starts to look sparse in some areas. Your dog’s ears, paw pads or eyes become inflamed or irritated. Depending on the cause, your dog may have one or several symptoms at the same time. If you see any of these warning signs, it is time to bring your dog to see your veterinarian. Is dog shampoo for dry skin helpful? When you suspect your dog may be suffering with dry skin issues, a trip to the veterinarian is always the best first step. Otherwise, you may not know if your dog has weather-related dry skin, parasites, allergies, a bacterial or fungal infection, a breed-specific known skin condition or something more serious, such as a systemic condition (endocrine or autoimmune, for example). Once your vet determines the cause, they can help you figure out how using a dry skin shampoo for dogs fits into your dog’s overall treatment plan. Your vet might recommend using a good dog shampoo for dry skin to help ease your pup’s discomfort while they are being treated for other health issues. Sometimes your dog may even have an allergy to the dog shampoo you are currently using, and need a hypoallergenic or medicated dog shampoo for dry skin. And sometimes your dog’s dry skin issues may be the result of too-infrequent or too-frequent baths. 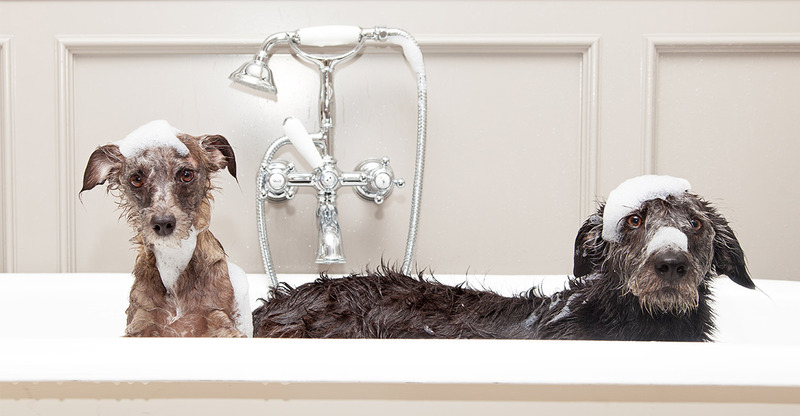 In either of these cases, changing your dog’s shampoo may really make all the difference. So now let’s take a closer look at the dog shampoo and conditioner for dry skin and dandruff for adult dogs and puppies! Vets often recommend the use of medicated dog shampoos to get rid of parasites, bacterial and fungal infections that cause skin irritation, dryness, flaking and breakage. If your dog has been diagnosed with parasites or a bacterial or fungal infection, you will want to be sure you use the right medicated dog shampoo to treat that specific issue. Your vet may also recommend a lotion or conditioner to rehydrate and nourish your dog’s skin. You can ask your vet about the following highly rated, vet-recommended medicated dog shampoo for dry skin products. This highly rated, vet-formulated medicated shampoo for dogs includes the active ingredients coal tar, micronized sulfur and salicylic acid. This shampoo is designed to treat mange, seborrhea (skin scaling), fungal infections, bacterial infections, parasitic infections and skin flaking (dandruff and similar conditions). This vet-recommended, highly rated medicated dog shampoo includes the active ingredients ketoconazole, aloe vera and chlorahexadine. The formula is designed to treat issues with yeast, pyoderma, ringworm, allergies, fungal and bacterial infections. This highly rated and popular medicated dog shampoo contains the active ingredients chlorhexidine gluconate TrizEDTA (tromethamine USP, disodium EDTA dihydrate) with ceramides to replenish natural skin moisture. It treats both gram-positive and gram-negative bacterial infections as well as fungal infections with an anti-microbial and anti-biotic formula. Veterinarians are becoming more open to the use of natural products like herbs, essential oils and health supplements to treat dog skin and health issues. The right combination of herbs, essential oils and natural soothers can not only ease skin irritation and discomfort, but can also protect your dog from pests, sun damage and common toxins. These natural dog shampoo for dry skin products are all highly rated by dog owners! The active ingredients in this popular and highly rated natural dog shampoo include neem oil, argan oil, shea butter, vetiver and rosemary, nutmeg, bentonite clay and aloe vera. It is organic, all natural and hypoallergenic. The recipe is designed to pH balance your dog’s skin to ease hot spots, skin allergies, dermatitis and bacterial and fungal issues. The bentonite clay binds to toxins like heavy metals and pesticides and pulls them away from the skin to reduce irritation. Sometimes dry, flaky or itching dog skin is caused by simple reactions to common surroundings – even the chemicals present in new carpet might cause a reaction if your dog has sensitive skin. Puppies can be especially vulnerable to environmental irritants, which is why this highly rated and popular hypoallergenic dog shampoo is designed to be safe for even puppies. Active ingredients include aloe vera, honey, rosemary and chamomile for a potent anti-allergen, anti-bacterial, anti-septic, anti-inflammatory and skin-soothing formula. This dog shampoo with hundreds of happy followers uses all natural and certified organic ingredients for a hypoallergenic formula even puppies can use safely. Active ingredients include rosemary, lemongrass (a natural flea deterrent), aloe vera, coconut oil and olive and jojoba oil for a soothing, nourishing shampoo. While your dog may not worry about unsightly skin flakes like you do, he is definitely not going to love the experience of having dandruff. 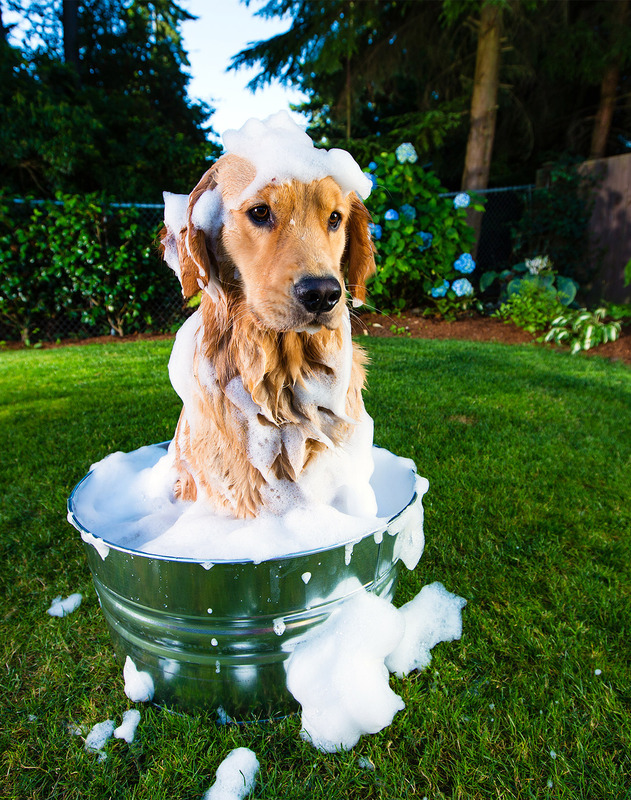 The sight of dog dandruff can also make you feel panicked to find the best dog shampoo for dry flaky skin right away! It can also be a symptom of nutritional imbalance, inadequate grooming or too-dry air. Your vet can figure out what is causing your dog’s dandruff and help you decide on the best dog shampoo for dandruff, which might be one of these products! This highly rated medicated dandruff shampoo for dogs is formulated to treat skin conditions such as seborrhea, dandruff, mange, folliculitis, acne, itching and dryness. The active ingredients include benzoyl peroxide, salicylic acid and micronized sulfur to balance skin pH and neutralize bacteria and fungi while rehydrating the skin. This well-loved and popular dandruff shampoo for dogs has the active ingredients benzoyl peroxide, salicylic acid and sulfur to remove bacteria, yeast, fungi and toxins that cause skin flaking, dryness, itching and clogged pores. This product is effective against skin discomfort caused by mange, demodex, dandruff, seborrhea, pyoderma, mites and acne. This highly rated medicated dandruff shampoo for dogs is a veterinary formula with the active ingredients chloroxylenol and salicylic acid. It also contains the botanicals china bark, aloe vera and chamomile for skin soothing and rehydrating. While all puppies will scratch to some degree, there is a difference between a puppy who scratches occasionally and a puppy that can’t stop scratching. Finding the best puppy shampoo for dry skin begins with diagnosing the reason for the skin itch. From there, one of these excellent and highly rated puppy shampoo for dry skin products may help your puppy feel better right away. This much-recommended “no tears” sensitive skin formula is gentle enough even for puppies. The active ingredients are all natural and include chamomile, aloe vera and rosemary to soothe, rehydrate and balance your dog’s skin (the shampoo has a neutral pH of 6.5 to 7). This highly praised product contains the active ingredients aloe vera, lavender, colloidal oatmeal and vanilla. The “tear free” formula is safe to use even on your puppy’s face. The vanilla and lavender help to send fleas and ticks packing. This highly rated combo is an all-in-one dog shampoo and conditioner for dry skin that is gentle enough for puppies. The active ingredients include colloidal oatmeal, baking soda and aloe vera to balance skin pH, rehydrate and soothe skin with its natural anti-bacterial, anti-fungal, anti-parasitic formula. All three of these dog shampoo for dry itchy skin products are all natural and highly praised by dog owners. Ask your vet which one is best for your dog’s itchy dry skin! This dog shampoo and conditioner all-in-one formula is loved by dog owners for its soothing, skin calming properties. Active ingredients include colloidal oatmeal, baking soda, coconut oil, aloe vera and vitamins. This highly rated best dog shampoo for dry itchy skin is packed with natural botanicals for nourishing and healing dry, itchy skin. Active ingredients include aloe vera, calendula, lavender, tea tree, emu oil, peppermint and spearmint essential oils, Zinca-PCA, allantoin and jojoba oil. Shea butter, tea tree oil, sunflower oil and vitamins are the key to making this highly rated and popular dog shampoo work to ease your dog’s skin irritations quickly. The concentrated formula can stretch four times farther by adding a bit of water into a 4:1 or 6:1 solution. It is so hard to watch your dog itch and scratch and suffer with skin irritation! You just want to find what will make her feel better right away! We hope reading through this list of highly rated, high quality dog shampoos has helped you to choose a shampoo that will provide your pup with fast relief. Are you using a product that has worked wonders for your dog’s skin health? Please share your story and find out what’s worked for other people over in the forum! D’Agnese, J., DVM, et al, “Itchy Dog Skin: Where Does It Stem From?,” Hudson Veterinary Hospital, 2018. Moriello, K.A., DVM, DACVD, et al, “Structure of the Skin in Dogs,” Merck Veterinary Manual, 2018. Overton, B.G., DVM, “Heal Your Dog’s Itchy Skin,” Irby-Overton Veterinary Hospital, 2017. Jeromin, A.M., RPh, DVM, DACVD, “Why Does My Dog Have Dry Skin?,” Veterinary News DVM360, 2003. Downing, R., DVM, DAAPM, DACVSMR, CVPP, “Nutrition, Skin & Dogs,” VCA Animal Hospital, 2015. Hogben, I., BVMS, “The Itchy Puppy,” Findon Vet, 2018.